Every person acts differently when he sees something unbelievable. But many people will think that it is a "fiction". Most people who had seen the terrorist attacks on the United States of America on September 11th, 2001, said that "I thought that they were making a film." Interestingly, when they were surprised by the Japanese navy, soldiers at Pearl Harbor thought the same thing. 50 years did not change people's minds. The college student thought that he had been hallucinating. Then, he remembered the amazing image.
. . . I was not hallucinating. She was a real bride. That was a real wedding dress. He looked at the train car, passing away from him. The impact was spreading all over the platform, just like a calm tsunami1 in a deep sea. Every person thinks that "If I am the only one to do something, things will not change." Indeed, men are much more interested in women's clothes than women realize. This interest comes from men's curiosity about women, and is not fetishism. The most understandable example is that, in general, men "love sailor-style for schoolgirls" more than women do. Though half of all people are female, no, not though but because, male really adore these "similar but different" beings. It is quite natural that human beings watch as well as they can when things almost never seen are in front of them. The college student did not notice that he had begun to follow the train car. The same thing had occurred on others in the platform. People fascinated by the bride in a train car began to follow the train car. This large crowd was growing larger by itself. The growth did not end until the train stopped. Now, the train is going to stop. The beauty, the bride with her neck and upper chest uncovered, had been excited and had waited for the moment. This was the most favorable stop for her. She glanced at a boy as tall as her. He was keeping his face down. Ayumi was not optimistic about the situation. Nobody can ignore such a bride in a station. I might be arrested. But. . . it is a large station. . . so maybe. It turned out to be despair, though. Ayumi saw a man next to the boy. The man glanced at her and was surprised. Though the man had moved away when he was surprised, every person Ayumi saw reacted differently. People in the train car proudly watched the people in the platform who were following the train car. Ayumi felt someone next to her. Ayumi's neck sensed that her earring was ringing. It might be because the beautiful girl helped the bride gather up her skirt, or because they were going to get off the train at this station, that the mob, who had been away from her, were next to her. "Calm down and look ahead." Yes, she is right. I have to look ahead. Ayumi's earrings rang as she looked forward. Nobody could imagine this situation. The huge crowd, tired from running and following, was waiting outside of the nearly stopped train car. Everyone took photographs of the bride with their cell phones. "Follow me. I will try." Is she going to. . . lead me? The train was going to stop. Ayumi, as a bride with white wedding dress, felt like the moment lasted forever. The passengers were shouting in excitement. They are interested in where the bride is going to, I think. Now, all I can do is follow the girl. I am holding my bouquet with my hands and my skirt with the whole of my arms. I cannot be led with my hands. Now, the door was open. As soon as the doors had opened, the beautiful girl ran up to the mob. She pushed back them with her hands. Ayumi was very thankful for her actions, but she had no time to express it. Ayumi's heels made a lot of noise against the platform, as she muddled through the crowd. The crowds were not evil fiends. So they, of course, did not violate this stranger. . . a bride got off the train car. 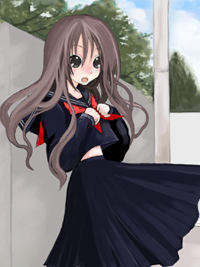 . .
Ayumi ran "bridally", with her arms full of her skirt. Ayumi's veil swung and "fake pearls" on her wedding dress glittered. That was transcendently beautiful. Now, the mob was parted into two, just like Moses's famed miraculous parting of the Red Sea. The skirt Ayumi was holding began spreading inch by inch. It did not matter to Ayumi and she kept running. Every people who saw the bride was surprised. Many schoolgirls were shouting in excitement. Oh. . . why. . . why am I troubled by such a happening? Ayumi was so sad that her eyes flooded with tears. There were stairs in front of her. Ayumi had been using urban train stations every day. So she should be used to them by now. But, Ayumi felt that the platform was really narrow. The platform was so narrow that she could touch the train cars on either side with her skirts. The girl who had helped me is now running up the stairs. Can I run up the stairs without dropping the skirt I am holding? But it is do or die. These shoes I am wearing are really stiff. The sneakers I wear every day are very soft but never stiff, but these seem to be made with glass. >Furthermore, they are high heeled ones and I have to stand on my toes and stiletto heels. I have to step up each stair with both "Neko Ashi Dachi"1 style toes and the stiletto instantaneously. If I only put my toe on the stair, I cannot keep my balance.
. . . Who ever invented such strange shoes? The bride was losing her temper. It seemed quite natural that the bride would lose her balance, for she was wearing "high-heeled shoes" that were really stiff and rigid. She had to run up the stairs with her arms, covered by very slippery gloves, full of her skirts that were thick and heavy like a comforter. She thought, "Hurry up!". However, the thought conflicted with another of her thoughts, "Keep your balance!". So, she pounded up the stairs made of iron. I am annoyed that I have to hurry. What is happening to my skirt behind me? It is an enormous bulk. I am holding most of it, but some parts might be spreading on the floor. I have been keeping my balance till now. I am lucky not to meet someone who would trip me. There was a worse thing for Ayumi. There were escalators, going up and down, beside the stairs. There were many people on the escalator going down. This escalator was the best spot to watch the bride. While she was running up the long stairs, about fifteen meters, the people on the escalator stared at her curiously. For the bride clad in a white wedding dress is running up the stairs when they come to the station as usual. Furthermore, as I go up, more people come just like conveyor belts. Ayumi was going to cry. I had gone up the stairs. As was usual in urban stations in Greater Tokyo, they seemed to be "under construction", for everything was covered by veneers and temporary buildings were everywhere. Furthermore, this lasted for several years. The surface of the stairs was made of a different material than what was used on the upstairs platform. There were something like sticky tapes on the edges of the veneers. When I turn the corner of the upstairs platform, then I will see ticket gates. The bride, hopeful about her plan, had run up all of the stairs with her uncovered upper chest and her back sweating. The girl was waiting at the upstairs platform. I think that she is trying to keep the people behind her away. There were rest rooms near the corner of the upstairs platform. When I was in the train car, I wanted to run into one of them, but now, I would never go. 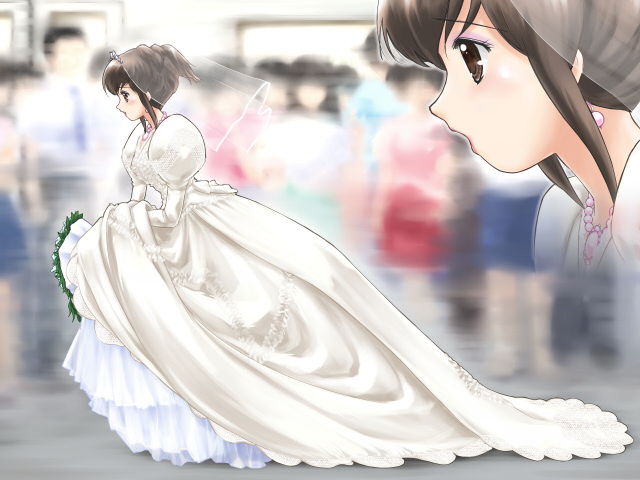 The girl met Ayumi's eyes and evaded past the bride. Ayumi did not have enough courage to turn her face back up. I think that the stuff behind me is just like a "Royal parade". . .
How can I get out. . . the gates. . . I have no pass or ticket. Ayumi had a good idea. Though it was not a very good idea, but it was the only one that she could try. I can not duck through an automated gate, but I can sneak through a manned gate instead. Though station workers might block me, I am able to duck through the gate, for I am a bride who just ran out of a train. . . well, I might not be able to, but maybe? Anyway, Ayumi, just had run "bridally" up the stairs, turned at the corner. ". . . ! !" She could not believe her eyes. This might be more unbelievable for her, than the transformation to a bride that had begun in a train car. All of the gates were automated! She looked around with her earrings ringing. She noticed that she was perfumed. She felt that her veil was just on her ears and neck. Certainly, there was a manned gate. However, it was at the opposite side, far from the automated gates here. H, how inconvenient. . . Is this not the center of Tokyo? . . . No, this is Kanagawa prefecture. . . Anyway, is there such a station like this in the greater Tokyo megalopolis? Ayumi did not know who was to blame for it. Then, her plan of sneaking through a manned gate had failed. There were gorgeous shops in the station-building1 beyond the gates. There was a fast-food restaurant, a flower shop, and a used book shop.
. . . It seemed to Ayumi that this were just like a downtown. S, should I have to get out from here? No need to say that, but the bride was attracting the attention of people around her. The girl was evading past them. She quickly took her wallet and put it on one of the gates. In greater Tokyo in Japan, there were systems that enables one to pass through ticket gates with just "one quick touch". The girl got the gate open by using her pass! Ayumi realized what she was doing and ran "bridally" to her. When Ayumi stopped next to her, the girl shouted. Ayumi was shocked and opened her eyes wide, made up "naturally" with mascara. No, she was dumbfounded at the sight. Though they were introduced at every station in the metropolis of Tokyo, the gates in this station did not have the systems that "enabled one to pass through ticket gates with just one quick touch"! They only had the systems that "accepted tickets or passes directly". "There is nothing to do for it! Anyway, go through the gate!" The girl was taking her pass from her wallet. It was obvious to everyone what she was going to do. Anyhow, she was going to get Ayumi out of the station. The girl put her pass in the gate without hesitation. The pass was accepted. And now, the gate was open. Ayumi could not say anything else. She went into the automated gate with her arms full of the skirts of her dress. She forced her way through the gate, so narrow that overweight people might have some trouble getting out, with her skirt chafing. Her pannier was being compressed transversely. She could not go through the gate without straining herself. Her skirt was pressed flat. Now, she had managed to get out of the station! Of course, she did not pick up the pass. The girl can take the pass and use it later. I was helped by her very much. I have no words to express my gratitude. Ayumi could not determine which way to go. Though she lived in greater Tokyo, she knew nothing about the station building, for she had never been here. Ayumi heard someone is calling her. She turned back and found the girl, blocked by the automated gate. It is natural. Only one person can go through a gate with a single pass. She was repeating a gesture that said "Come here!" Ayumi did not like to waste even one second, but she felt she had to go. She pounded and ran to her, with her skirt making into a mess. She is taking a bill from her wallet. I see! The girl stuffed her bill into Ayumi's mouth. "Turn right and go straight, and you will see a taxi stand!" The girl was pointing the way. The bride nodded quickly and began to run again. Ayumi heard the girl's voice from behind her bare back.